[T]here is a peculiar illusion incidental to all knowledge acquired in the way of education: the illusion of finality. —R.G. Collingwood, The Idea of History (1946). As a rule, historians do not often question their role as historical agents. While some simply do not think about it, others seem rather reluctant to imagine themselves as objects of investigation and source-producers for future generations of researchers. As (usually avowed) bookworms, we tend to take our bird’s-eye view on the past for granted and are used to distancing ourselves from our topic. Granted, some prominent scholars, like Marc Bloch and, on the Canadian scene, Bryan Palmer, have engaged in historical reflections on a past they themselves inhabited, but these do not include conjectures on the “future perfect” dimension of their present, namely how it might be interpreted by historians in the future. 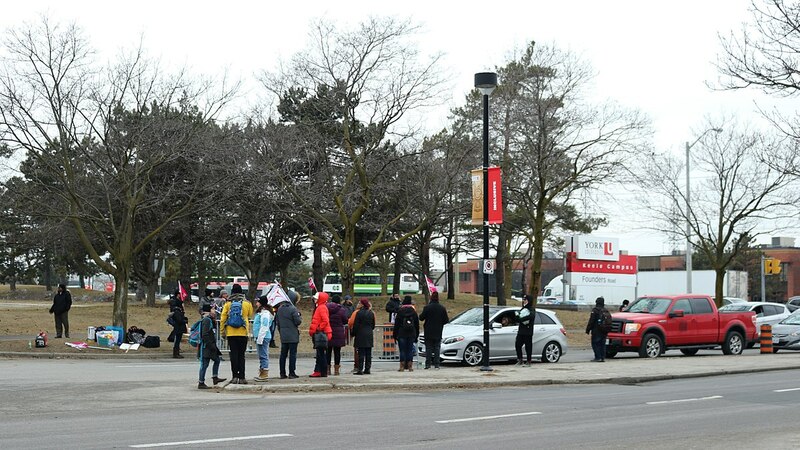 In that regard, the latest strike by York University’s CUPE 3903 has given me fodder for thought. The dispute, which ended on July 25, 2018, was a three-month affair for me, as contract faculty members (aka “sessionals”), of which I am one, went back to work on June 15. During the time spent on the Glendon picket line as a rank-and-file member, I witnessed countless discussions, debates, and observed several changes and continuities with the previous labour disruptions I was involved in, namely the 2008-9 and 2015 strikes. The notes I took during those three months inspired me to write this somewhat unusual, experimental post, which reflects on the dizzying amount of sources that can be produced in a short amount of time. In our line of work, historiography is often treated as a necessary evil, a distant arena that not only enables us to locate our own work within the discipline, but also implies a certain distance from the topics under study. Simply put, historiography deals with the ways in which historians have conceived of the past, and what sources and methodologies they have used in order to make sense of it. It also investigates the various trends, schools of thought, and debates that have marked the development of history even before it became an academic discipline in its own right. Essentially, historiography straddles the realms of historical investigation and philosophy. Although I have taught historiography for the last three years at York University’s Glendon College, it only recently occurred to me that historians – and historiographers in particular – tend to adopt a totalizing view of the past, often taking an “end-of-history,” Fukuyamesque approach to their subjects. However, Collingwood’s “illusion of finality” quoted in the epigraph to this post does not systematically stem from a temptation or (sub)conscious will to see one’s field or discipline as complete and unalterable. Faced with countless sources and multiple possible approaches to any given topic, researchers have no choice but to resort to heuristic techniques and to pretend that they fully master their subject. Whereas humility is a prerequisite to any intellectual endeavour, timidity can prove as damning. Therefore, I believe that historians should not refrain from getting out of their comfort zone and embrace the present as the antechamber of history. When does the (micro-)historical agent begin, where does s/he end? In other words, when and where can a historian afford to engage in a critical analysis without risking a conflict of interest and losing the advantage of hindsight? What sources are worth recording and studying? Is there a need to cast one’s net wide, or do historians have no choice but to be more discriminatory in order not to drown in an ocean of information? To be completely honest, these questions were initially rhetorical, and I expected the exercise to be feasible, albeit challenging. However, I soon realized that even well-circumscribed, seemingly minor events are richer and more complex than they appear. Over the last ten years, I was on strike for seven months – three in 2008-9, one in 2015, and more than three in 2018. As a CUPE 3903 member since 2005, I thought that I was in familiar territory and, as a result, could get a relatively clear view of what was going on and appreciate changes and continuities in the history of the local. While the administration’s and 3903’s respective communication strategies and the media coverage of the strike were predictable, it soon became evident that being an actor (well, more of an extra, actually) in an obscure, independent film made my task incredibly more arduous than if I had tackled an unfamiliar event that had occurred long ago. Digesting the mass of emails, making sense of the daily drama, and of the twists and turns of the events as they happened soon became impossible. After a few days, the main challenge no longer consisted of sorting out the wheat from the chaff, but of distinguishing wheat that looked like chaff, and vice versa. Historians have no choice but to accept the relics and debris of the past and resign themselves to the impossibility of knowing everything. Furthermore, they benefit from what can be called “distance capital”, which endows scholars with an implicit and illusory aura of wisdom and objectivity. Although most authors will rightly reject any claims to absolute neutrality and scientific rigor, the community of historians and lay readers expect authors to come up with thorough, conceptually sound studies devoid of obvious ideological bias. As naïve as such expectations may sound, they constitute most researchers’ drive for the Holy Grail: write the magnum opus, the book to end all books. While it seems that, by the end of their first year, attentive undergraduate students come to realize that objectivity and absence of bias are chimeras, few scholars do not dream of writing or reading THE definitive work on a given topic. But revisionisms of all kinds – sometimes due to new discoveries, others to fresh perspectives – are always bound to emerge in the more or less distant future. In the case of CUPE 3903’s latest strike, the cornucopia of sources and the unfathomable depth and multifacetedness of the topic was too overwhelming for anyone to be able to make sense of it while it was happening. Whereas the main narratives were relatively easy to figure out, with an administration claiming that CUPE’s demands were unreasonable and its leadership and activist core made up of unflinching radicals, and a union advocating for more job security and professional development, a closer look reveals less Manichean dynamics, with multiple players and agendas within the union local, full-time faculty members, the student body, non-academic employees, and the administration itself. In addition, layers upon layers of rumors, misinformation, and conjecture – also sources in their own right – completed the already overloaded, chaotic scenery of the strike. Granted, a small amount of sources, compiled in a digest, might give a sense of what was actually going on, or, as Leopold von Ranke famously put it, “wie es eigentlich gewesen” (how it actually happened). A concise press review, a summary of general meeting minutes and list serve discussions, and a few samples of York’s various memoranda and messages to the students and union members would suffice in order to get a general understanding of the situation. However, my inability to keep up with the pace of the events exacerbated my regret at not being able to get my hands on many important sources. For instance, most private correspondences will not be made available in the immediate future, if at all; the same goes for in camera meetings of all sorts, various caucuses, and what was actually said in the upper echelons of York’s administration and the Board of Governors. Nonetheless, one can still nurture the hope that someday a number of those documents will be made available. As for any attempt to write an oral history of the strike, it will inevitably face the challenges inherent to that particular approach, i.e., the filter of hindsight. While oral histories have of course proven extremely valuable, post-hoc testimonies should always be taken with a grain of salt, as they straddle the realms of primary and secondary sources. My failure at capturing the exact essence, rhythm, and contents of several discussions and debates that took place on the Glendon picket line and elsewhere remains a major frustration, though I am fully conscious of the many methodological and ethical obstacles such an endeavour would have involved. Thus, countless fascinating conversations on strategy, academia, politics, sports, and other topics sank into oblivion, joining the galaxy of lost moments and words in the graveyard of history. I remember some of those discussions, but not verbatim. One of them, which I had with C. C., one of our most valuable “car whisperers”, had to do with history and memory – in other words, how this event might be remembered in the future. After discovering a common love for Homer’s works, we engaged in a tongue-in-cheek anticipatory history of the strike. We jokingly started from the (silly) assumption that the siege of Troy was just a minor dispute that subsequent chroniclers blew out of proportion, and that, perhaps, 3,300 years from now, the longest university strike in Canadian history will have been transformed into an epic battle. This is evidently all absurd and burlesque (in the literary sense of the word) but revealing of the frustration and overall feeling of meaninglessness that some of us felt at the time. This general despondency among sessional faculty was not only due to the increasing casualization of our labour, but also to the lack of meaningful dialogue between our union and a university administration immersed in a myopic, counterproductive siege mentality. I wish I had been a fly on the wall during administrative meetings, as the rationale for some of York’s decisions and communication strategies remains a mystery to me, especially as far as the long-term goals are concerned. However, the legitimate criticisms towards an institution whose opaque policies and involvement in the consistent surveillance of strikers (and other controversial practices) should not preclude 3903 members from engaging in self-criticism. In the wake of the 2008-9 strike, a series of discussions among history graduate students regarding the lack of institutional memory in CUPE 3903 led to the creation of an archive committee. Unfortunately, the four-page proposal I drafted and summarized at the March 2009 AGM (Annual General Meeting) did not have an immediate impact on the executive and the union in general. It is nonetheless encouraging to see that, in the last couple of years, some members have taken serious steps to maintain and expand the 3903 archive. It may seem ironic to some that a historian would care so much about the present. However, this is a misconception, as the present and the future will eventually become the past, thereby becoming fodder for historical research. In addition, I would most certainly have ended up losing my mind, had I not come to the picket line as both a worker and a historian. Cataloguing sources and locating narrative threads, though inevitably non-exhaustive, ended up playing a therapeutic role, and kept my mind from going rusty. At the end of the day, this was a bittersweet exercise. On the one hand, I experienced firsthand the impossibility of embracing even a small sample of the past. On the other, the wealth of meaningful, exploitable sources, made me marvel at the inexhaustible goldmines that future generations of historians will be able to access. Alban Bargain-Villéger is a sessional faculty member at York University, where he specializes in modern European history. His current research project involves a comparative study of Arran, Borkum, and Groix, three small islands off the coasts of Scotland, France, and Germany, respectively. Marc Bloch, L’Étrange défaite: témoignage écrit en 1940 (Paris: Gallimard, 1990); Bryan D. Palmer, Canada’s 1960s: The Ironies of Identity in a Rebellious Era (Toronto: University of Toronto Press, 2009). CUPE 3903’s Unit 1 represents PhD students employed as teaching assistants. Unit 2 includes all contract faculty members. Unit 3 (a greatly endangered species since the early 2010s) represents all MA students employed at and by York (usually as graduate assistants). Georg Wilhelm Friedrich Hegel, Lectures on the Philosophy of History, trans. Sibree (London: William Colwes and Sons, 1878), 30. In that regard, the otherwise cursory, poorly researched report drafted by William Kaplan in April 2018 provides a fairly accurate summary of the York administration’s perspective on CUPE 3903. See William Kaplan, “Report in the Matter of an Industrial Inquiry Commission Pursuant to Section 37 of the Labour Relations Act, 1995 and in the Matter of the Negotiation of New Collective Agreements to Replace the Ones that Expired on August 31, 2017 between CUPE, Local 3903, Units 1, 2 & 3 and York University,” April 2018, 5-6, http://labour.yorku.ca/wp-content/uploads/2018/05/Kaplan-Report.pdf. Leopold von Ranke, “Excerpts from Selected Works (1824-1881),” German History in Documents and Images, http://ghdi.ghi-dc.org/sub_document.cfm?document_id=358, 1. See, for instance, the CUPE 3903 website’s section devoted to past strikes and bargaining sessions: https://3903.cupe.ca/archive/.